As Oakleaf hydrangeas age, the peeling bark becomes more pronounced. River birch bark comes off in large sheets. 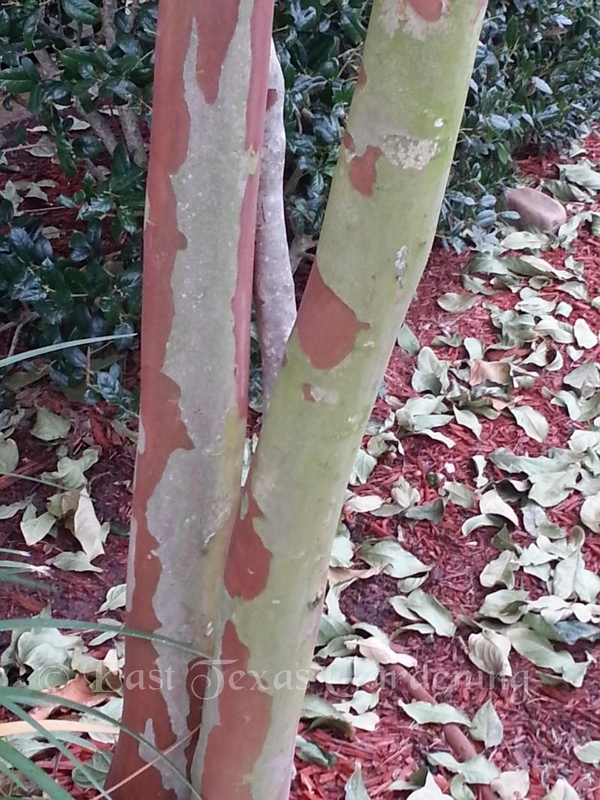 Different crape myrtle varieties have different shades of bark, revealed every other year. 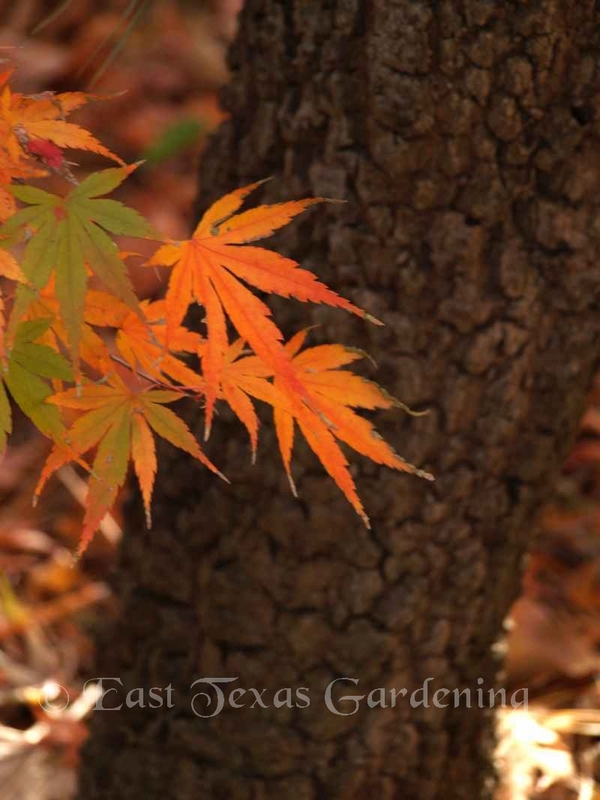 Japanese maple ‘Arakawa’ shows its unusual rough bark and attractive orange fall colors. 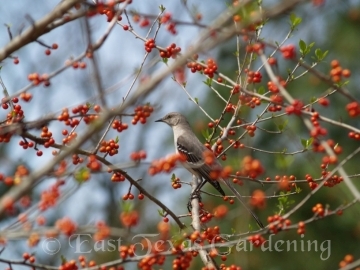 Mockingbird jealously guarding "his" food that is promimently displayed on the decidous holly, often called possumhaw holly. Winter is not the most favorite time of year for most folks when it comes to gardening and enjoying your yard. The bright flowers of summer are a faded memory, fall tree colors have dropped to the ground, and the days grow shorter as we approach the winter solstice, bringing chilly, often damp, cloudy and dreary conditions. Yet, the changing seasons also bring about transformations in the yard and landscape that cannot be appreciated at other times of the year. Now that trees are bare, their interesting branching architecture can be appreciated, along with any glaring defects like dangerously hanging branches. 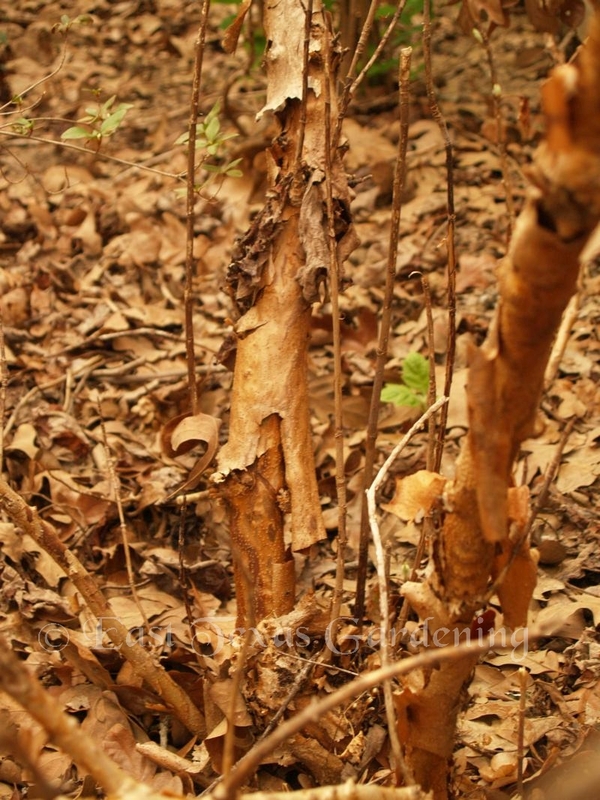 The attractive peeling bark of river birch, crape myrtles, and oakleaf hydrangeas can be better appreciated without the competition of the foliage. Other interesting bark patterns pop out at this time of year after the clothing of leaves has been shed to unveil what lay behind. It’s only in winter one can appreciate Harry Lauder’s Walking Stick (Corylus avellana ‘Contorta’). During the summer, one is underwhelmed with this plant – definitely not the star of the spring or summer landscape. But once the leaves are gone, the mass of dramatically twisted, curling branches jumps out at you visually and becomes the center of attention. A few years ago I was taking a photo of a Japanese maple with bright red-orange leaves, when I noticed its very unusual warty bark on the trunk – something I had missed all these years of regularly passing by this tree. The variety is called ‘Arakawa’, and I discovered that is the Japanese word for “rough bark”. An already great tree for the landscape just went up another notch on my appreciation meter. 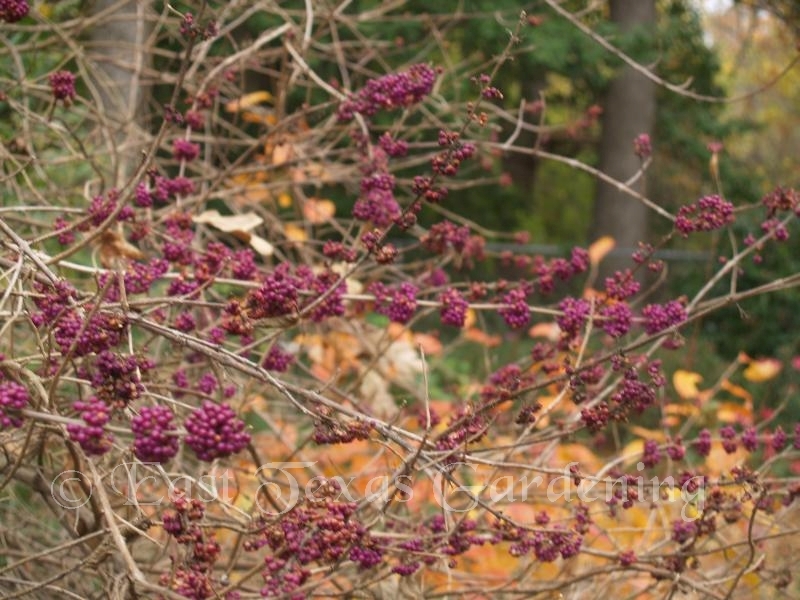 Trees and shrubs with berries take center stage now as they mature to their final colors. The colorful purple berries of American beautyberry may not be as beautiful to us this late in the season, but is a feast to birds, especially mockingbirds, cardinals and other berry eaters..
Carolina snailseed (Cocculus carolinus), so called because of the shape of the seeds inside the berries. You won’t find this native vine for sale, but if you come across one, grab a few berries for their seeds to sow and grow on a fence or other support. Of course, hollies are synonymous with berries, and are one of the more popular groups of plants used in landscaping. Not all hollies have berries, because a plant can be either a male, which only bears pollen-bearing flowers, or one with female-only flowers, which when pollinated turn into the berries. This fact is important mainly if you are in the woods looking at young holly plants you might desire to use in your yard. The good news is that hollies sold in garden centers are clonally propagated. If a named variety is known for bearing fruit, it will have fruit in your yard, and bees take care of the pollination issue. American holly, yaupon holly and possumhaw (or deciduous holly) are 3 of the more common plants that are native to east Texas. Note that the common dwarf yaupon holly variety is a male clone, so it will never bear fruit. Yaupon Holly (Ilex vomitoria) is a small, evergreen tree that makes an outstanding landscape specimen. The small, dark green leaves make a perfect foil for bright red berries covering the tree. 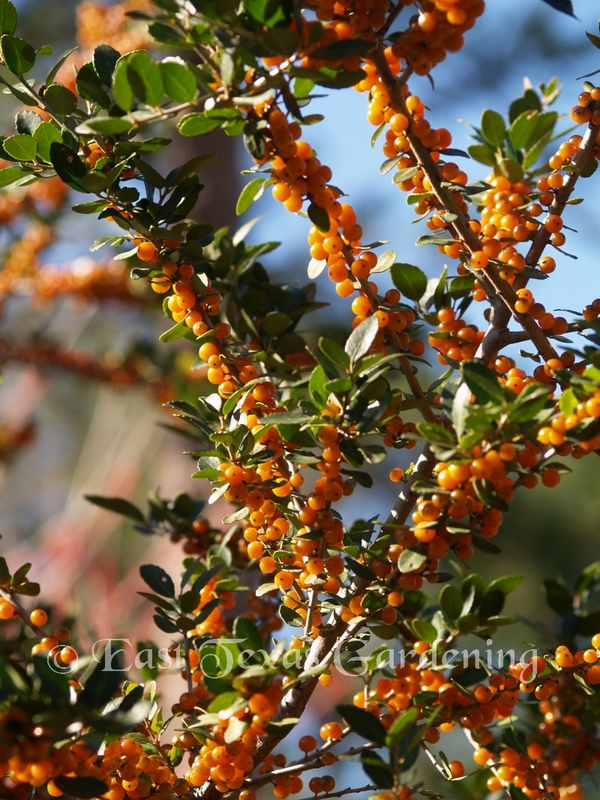 A few varieties bear other colors, such as ‘Virginia Dare’ with orange berries, seen in the IDEA Garden. And the weeping yaupon holly provides drama with its strongly descending pendulous branches loaded with red berries. Possumhaw holly (Ilex decidua) loses its leaves in the winter, revealing a bounty of red to orangey-red berries cherished by a wide variety of birds, especially mockingbirds and cedar waxwings. Speaking of birds, a common question in late fall or early winter is, "Where are all the birds?" Ornithologist Cliff Shackelford of the Texas Parks and Wildlife answers that there is an abundance of food available in the wild due to rains of summer and fall. 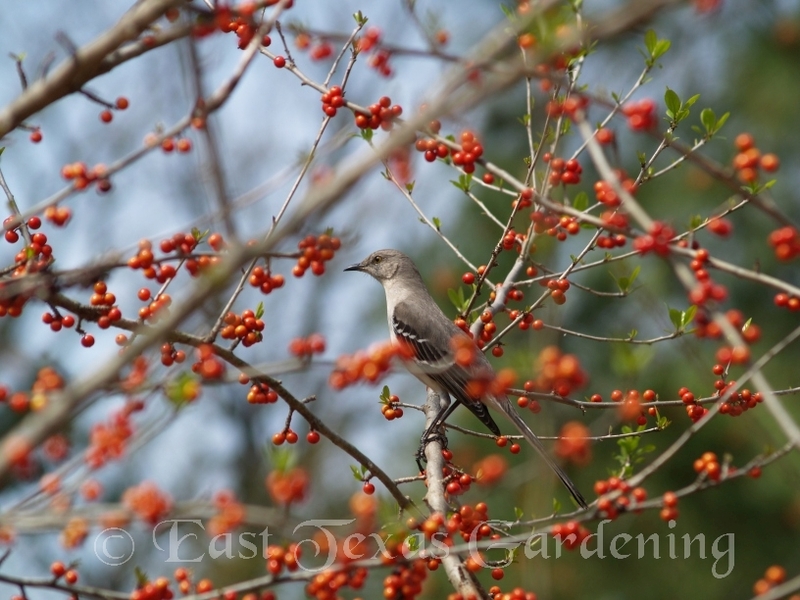 This means birds at this time are not so dependent on our feeders while nature’s bounty lasts. 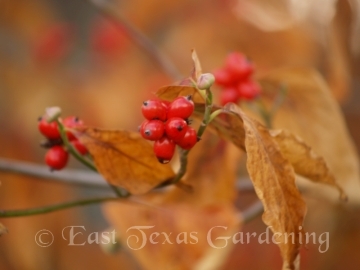 Our beloved dogwoods not only have pretty spring flowers, but after the colorful fall foliage falls, the attractive red berries are on full display until consumed by birds. 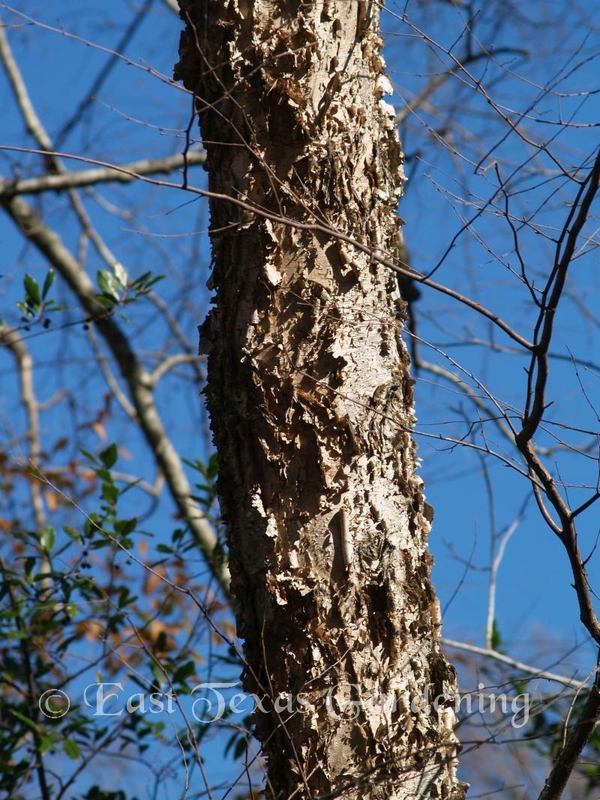 The blocky patterned bark of dogwoods is also attractive. 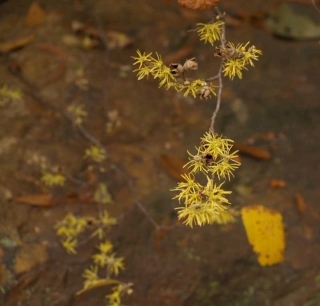 Winter flowers are not all that common, but they do exist. Of course, pansies, snapdragons and stock are some annuals we can plant and enjoy well into next spring. But there are other sources of flowers besides annuals. 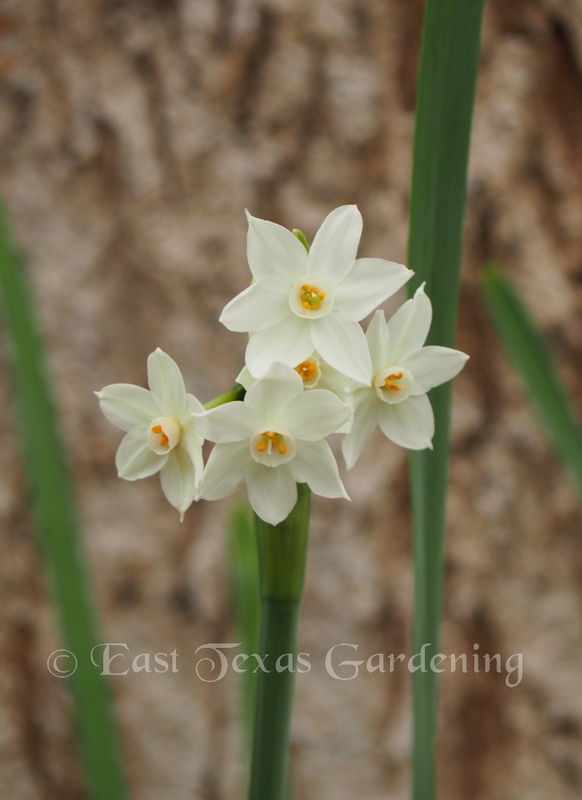 Starting in December, paperwhite narcissus begin the winter parade of sweet-smelling flowers that faithfully return every year to cheer up the winter blahs, followed by other narcissus varieties in the coming months. 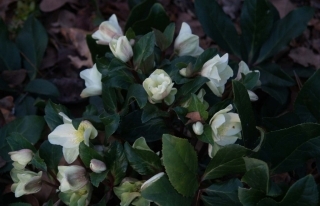 Hellebores, also called Lenten rose, are wonderful evergreen perennials that laugh at the cold, and begin blooming in the winter. A very easy plant to grow, perfect for shady spots in the yard such as under trees. In addition to the less expensive unnamed varieties (which are perfectly great plants for any landscape), named varieties, such as ‘HGC Cinnamon Snow’ with their improved bloom color or abundance, make great plants for early season bloom in the shade. Camellias are favorite evergreen shrubs in east Texas, with Camellia sasanqua beginning the show in the fall, continued by Camellia japonica on into the early spring season. 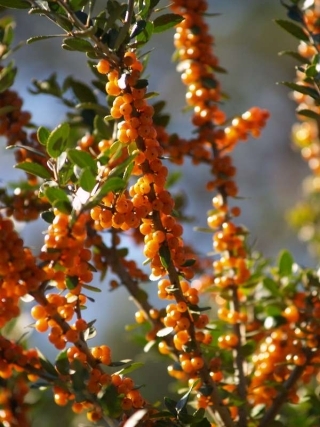 Every garden and landscape with a spot protected from the hot western sun should have at least one, prefreably more, of these wonderful shrubs to enjoy during the winter. Witchhazels (Hamamellis) are one of the few plants that blooms at this time of year - they are wonderful and underutilized large shrubs or small trees. Ornamental grasses also stand out in the winter, their dried foliage overtopped with attractive flower plumes which gracefully swaying in the every breeze. 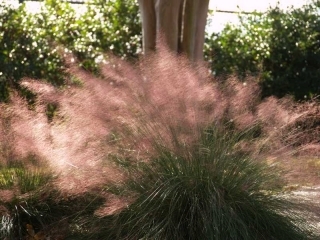 When planted where they can be viewed backlit by the sun, they can create a memorable view, such as this Muhlenbergia capillaris, commonly called pink muhlygrass.